Discover Latvia’s beautiful capital, Riga! What makes Riga the best place for your next Russian language course? Read on to find out! 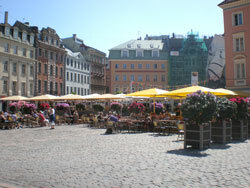 Often overlooked as a study destination, Riga, the capital of Latvia is actually an ideal place to learn Russian. Immerse yourself in Latvia’s natural beauty whilst discovering the impressive cultural heritage of its capital. Delicious food and drink also awaits your visit! What can you expect on a trip to Riga? What are the best parts of this city and why do we like it so much?